Mulch is a gardener’s best friend. It conserves soil moisture, protects roots in winter and suppresses growth of weeds – and it looks nicer than bare soil. As it decomposes, mulch improves the texture of the soil and adds valuable nutrients. All that being said, can you grow plants in mulch alone? Read on to learn more. Most gardeners prefer to plant in soil and spread a few inches of mulch on top of the soil – around the plant but not covering it. As a general rule, most experienced gardeners aren’t crazy about the idea of planting in mulch, or about using mulch in place of soil. If you want to experiment with mulch gardening, it may be worth a try, but start small in case the experiment doesn’t work. You may be able to plant annuals, such as petunias, begonias or marigolds, directly in mulch. Annuals only live a single growing season, so you don’t have to worry about maintaining the plant for its long lifespan. However, the plants will require water frequently, as moisture drains through mulch very quickly. Without the stability provided by the soil, the plants may not survive a long blooming season. Additionally, plants are unable to draw important nutrients from the soil. Perennials will probably have a more difficult time surviving in mulch only gardens. If you decide to give it a try, remember that water is key because there’s no soil to hold moisture. Check the plants often, especially during hot, dry weather. 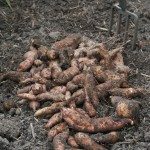 You’re likely to have a difficult time planting seeds in mulch, but again, it’s worth a try, and you may discover that the technique actually works! Chances of success are better if the mulch is broken down like fine compost. Coarse mulch doesn’t provide much support for seedlings – if they germinate at all. If you decide to try planting in mulch, you’ll need at least 8 inches. This can make mulch gardening expensive if you don’t have a ready source.